He studied sculpture at L'Ecole des Beaux Art in Paris and was accepted by the Salon des Artists from the age of sixteen. Without abandoning his sculpture, he devoted himself to drawing, watercolours and engraving. 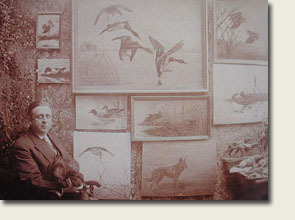 His specific interest developed towards country scenes with particular attention to dogs. Danchin's work is widely recognized as some of the finest when it comes to the canine species. He specialized in sporting dogs and his images grace some of the most prestigious homes in the world. Danchin's fine eye for detail and expression is evident in all of his work. Besides painting and sculpting he produced about one hundred engravings and lithographs, which were immediately successful in the art world. Leon Danchin died at the beginning of the Second World War in Bergues, where he is now buried. 1928 to 1932 Almanach du Chasseur (illustrated covers).